Diary Uganda (Budongo Forest Reserve – Chimp trekking) On the way to Murchison Falls NP we stopped off in the pouring rain at Budongo FR. Camped the night although I was in bed and asleep before 7pm as driving on dirt roads sometimes really takes it out of me. We were up at 7am to walk around the rain forest in search of chimpanzees. We are not going Gorilla Trekking as you have to be at least 15 years old and costs $375 per person, putting it beyond my value for money meter. Chimps are really noisy, but quite hard to spot. Really amazing experience although any creature which wants to live in a tropical rainforest should try a whole day in a damp sauna before booking their tickets. Chimps share 98% of their DNA with humans making them our closest living relative. Scientifically speaking they are closer to human kind than all the forwards at Midsummer Norton RFC who average 84% human DNA with the loose head prop having a mere 62%. I know I’ve tried to communicate with it! 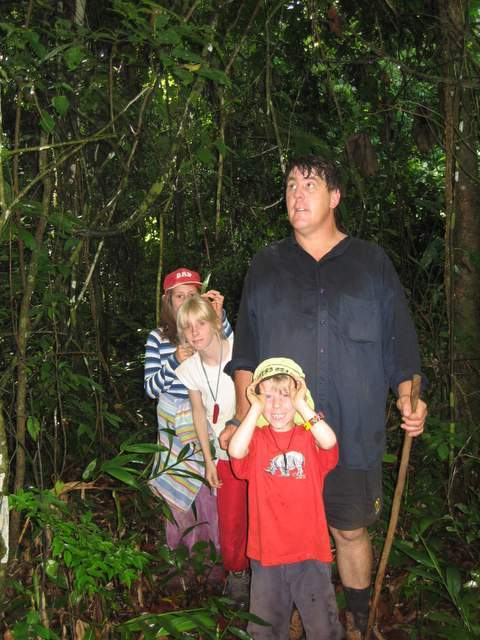 PIC SHOWS: IS THIS A RAINFOREST DAD?